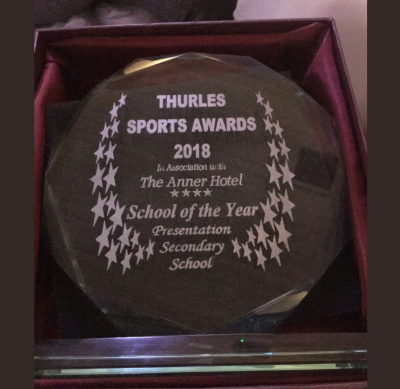 We were delighted to receive “School of the Year” at the recent Thurles Sports Awards held in the Anner Hotel, Thurles. The award was in recognition of the historic “treble” achieved by the school in 2018, becoming the first girls school to secure Munster titles in Soccer, Camogie and Ladies Football in the same year. Congratulations to all involved. Bhí lá den scoth againn ar fad inniu nuair a tháinig Mícheál Ó Ruairc ar cuairt chun na scoile chun labhairt linn. Chuireamar fíor chaoin fáilte roimh Mhícheál. Labhair sé linn faoin scéal iontach “Spás” atá scríofa aige, faoi Ghaeltacht Chorca Dhuibhne agus faoin scrúdú cainte. Mairfidh a chuid cainte i gcuimhne na ndaltaí go brách agus beidh sé mar bhuntáiste acu agus iad i mbun staidéir agus i mbun scrúdaithe. Bhain na daltaí taitneamh thar na bearta as agus táimíd faoi chomaoin mhór ag Mícheál as am a chaitheamh linn. Third year student Aoibheann Clancy has had a stellar sporting career to date.She started playing soccer at Kilbehenny Celtic Soccer Club when she was twelve years of age, before moving on to play with Tipperary Town Football Club. She represented Munster Schools under fifteen team in 2016 and 2017. She went on to represent Ireland Schools for the first time at under fifteen level. The following year she represented Ireland Schools in the prestigious Bob Doherty Cup, emerging victorious over England, Wales and Northern Ireland. At fifteen years of age she played a full game of 90 minutes in all three European under seventeen Elite Qualifiers. At present, Aoibheann is training with Limerick FC in the under seventeen Women’s National League. With our school Aoibheann has won two Munster Minor A medals, two Munster Senior A medals and an All-Ireland Senior A Medal, all in soccer. In camogie she has won a Munster A Medal. In football, she has won two Munster Medals and one All Ireland medal. Next week Aoibheann will head to an U16 training camp in Belgium with the Irish team and then on to the Czech Republic for a tournament in May. Continued success to Aoibheann in her sporting pursuits. Congratulations to Roisín Donnelly who has received a scholarship from the Government of the Federal Republic of Germany in summer 2019. Roisín has been given this award on the basis of having performed exceptionally well in German in the Junior Cert Examination 2018 and in a subsequent interview at the Goethe Institut in Dublin recently. This scholarship finances a three week stay in Germany where Roisín will stay with a host family and study in a local school. Congratulations to her teacher Ms Lewis. Our school has been awarded a ‘Silver Global Citizenship Passport’ in recognition of the work done in the school in relation to climate change and raising awareness of global issues including the treatment of women and gender equality. This initiative was taken by the Green Schools Committee, Model UN and the Student Council. 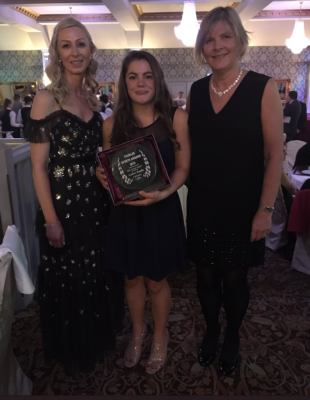 The girls who accepted the award on behalf of the school were Helen Aherne, Edel Dwan, Emma Hayes and Sarah Owens. Well done to the students and their teachers Ms McGee and Ms Glascott. Presentation Thurles scooped yet another Munster ‘A’ soccer title on Tuesday last at a wet and windswept Cahir Park. This time it was the turn of the first year girls to secure glory for their school as they beat a much fancied St Mary’s Newport in a tight and tense Munster final. There was a carnival atmosphere in Cahir as both schools brought huge support on the day. The Newport girls made all the running in the opening exchanges and were denied the opening goal thanks to the timely interventions of Ellen Maher, Holly Maher, Aoife O’Reilly and Kate O’Keeffe. Having weathered the initial storm, the Pres girls settled into the contest and the excellent Ava Ryan and Molly O’Dwyer started to dominate in the middle of the field .Chloe Shorley, Kate Ralph and Kate O’Hora worked tirelessly throughout and it was this work ethic that laid the foundation for this victory. Henrietta Kiernan was a constant thorn in the Newport side and it was her probing runs that ultimately led to the pivotal moment in the game.With the match scoreless at half time, the Pres girls came out firing on all cylinders in the second half .A typical Henrietta Kiernan run ended with her being fouled by a Newport defender. This resulted in a penalty kick to the Pres. The large crowd paused to catch their breath and all eyes were fixed on Molly as she expertly stroked the ball to the Newport net to put her side in front. St Mary’s laid siege to the Pres goal for the remaining minutes but Roisin Dwan who had been a fantastic presence in the Pres goal was not to be passed. Rachel Ralph’s introduction in the second half was a big factor in the victory as she made several clearances in the closing stages. The referee’s final whistle was met by rapturous applause as once again Pres Thurles had scaled the dizzy heights of Munster success. As part of our study of contemporary issues , Naomh Padraig CSPE class discussed how Ireland has changed through the generations. In order to learn more about this important topic we invited members of our family and community, a number of whom were past pupils, to morning coffee on Tuesday 9th of April. The resulting discussion was both fascinating and informative. Participants shared stories on their experiences of ageism, education both past and present, mental health, and the positive and negative impact of social change. Audio recordings were made of each discussion , and it is envisioned that these recordings will create a valuable archive for future reference. We would like to thank everyone who participated including Nellie Leahy, Josie Kelly, Bernie O’Dowd, Lil Davis, Catherine Moriarty, Judy Ryan, Mary Cleere, Margaret Dwyer, Rita Costello, Catherine Feehan and Sister Theophane. Last Wednesday, April 3rd, saw the TY’s organise their Disability Awareness Day. The day began with a mouth painting competition for 1st years.The TY students wore odd socks and blue clothing to raise awareness of Down Syndrome and Autism. Throughout the day posters were displayed encouraging awareness of disability and focusing on the importance of inclusion. 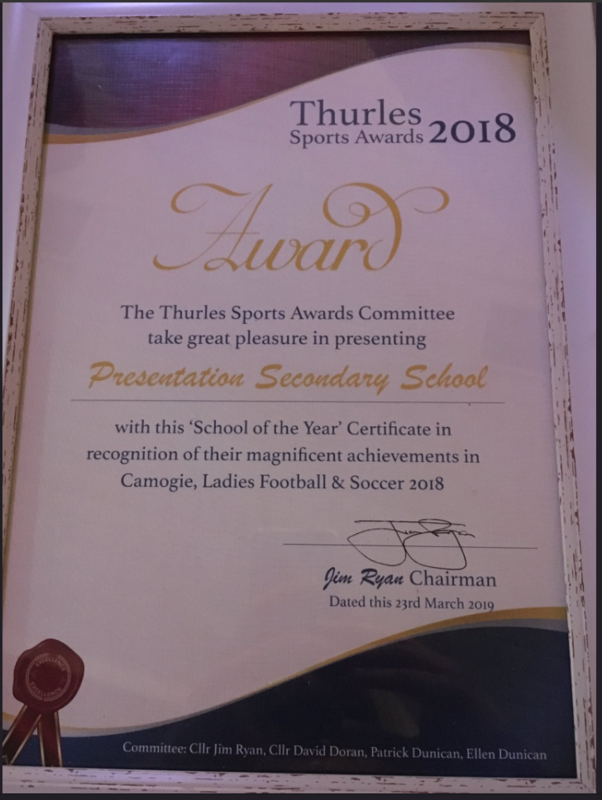 The highlight of the day was the talk from Mary Maher of the Thurles Branch of the Special Olympics and Maureen O’Shea, holder of two Olympic medals. The girls were fascinated by this informative and inspirational talk. 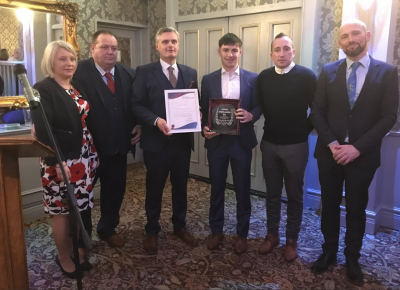 The day was the culmination of a year long Challenge to Change project, which included fundraising for a number of local charities involved in working with people with disability. Second year religion students enjoyed a visit to the Islamic Cultural Centre and Mosque in Clonskeagh , and a trip to the Jewish Museum in Portobello, both in Dublin. This was a very thought provoking and informative day and was thoroughly enjoyed by all. Congratulations to the 1st year basketball team who took part in the All Ireland playoffs in Ennis earlier in the week. Coláiste Pobail Setanta , Dublin, St.Mary’s Mallow and Coláiste Muire, Ennis provided the opposition. Coláiste Pobail Setanta were overall pool winners and progress to the All Ireland semi final. The girls enjoyed the day and playing in these games provided valuable experience which will stand to them in the future. There was great action later in the week when Knights Basketball club, in conjunction with Tipperary Sports partnership, the hosted the ‘Hoops for Girls’ participation blitz. A special thanks to Martin Hehir for organising a great day with over 200 girls taking part from various secondary schools across the county .